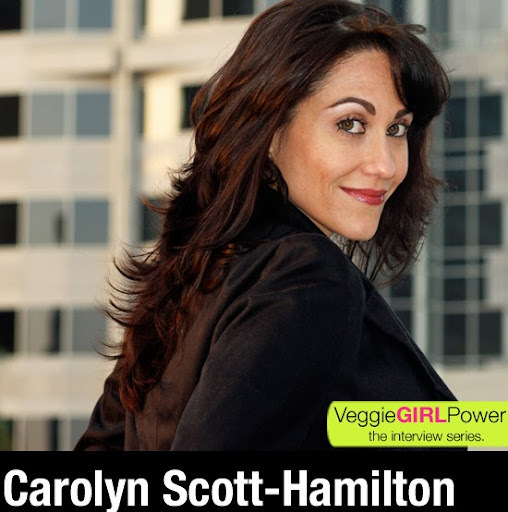 Carolyn Scott-Hamilton's Veggie Girl Power Interview! Today's Veggie Girl Power superwoman is Carolyn Scott-Hamilton, aka The Healthy Voyager! Four words I'd use to describe Carolyn: worldly, charismatic, energetic and warm. Get to know Carolyn!.. Well-Traveled Vegan! Ah, what I wouldn't give to grab my passport and a carry-on bag and jet out into the horizon with Carolyn leading the way. When I think of worldly vegan ladies my mind darts to Carolyn, aka the Healthy Voyager. When I first stumbled upon Carolyn's website, I was impressed and envious of her photos, stories and videos from traveling around the world. Carolyn is an expert on healthy, vegan travel - and her fun and vibrant personality turns every travel experience into an exciting adventure! Carolyn is a sort of modern, vegan Carmine Sandiego. Vegan Travel Made Fun! The internet seems to be saturated with travel websites - but I love to visit Carolyn's site as a sort of vegan calm island in the middle of a travel hurricane. Straight advice with fun tips and quips from Carolyn's smart and sassy point of view. Her videos are incredibly entertaining and informative. Someone give this woman her own show! I'd watch! 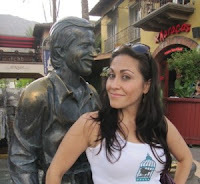 ...And if you really want to travel with Carolyn, check out her Healthy Voyager Travel Tours! And yes, Carolyn even has her first cookbook coming out next fall! Yum. 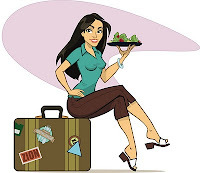 A few of Carolyn's stellar travel videos..
Carolyn: Oh man, well, i try to eat as clean as possible so I try to stay away from the faux meats and cheeses. But I'm not gonna lie, I do indulge in some gardein chick'n, daiya cheese and field roast every now and again! Carolyn: Well, even though these gals aren't remotely vegan, I do love what Paula Deen and Rachel ray have done for home cooking. Each had humble roots and because of their love of food, people and their fun personalities, they have really inspired a whole new generation of home cooks. From gals who just liked to cook to empires of cookbooks, products, shows and restaurants, I'd love to soon become the healthy version of them and be the voice of the special diet market. Carolyn:I didn't know a single vegan so I basically lived on cucumber sandwiches and guacamole. So I guess lack of variety was tough for me. but I quickly came to find ways to get creative in the kitchen while more and more veggie places began to open up just in time! Carolyn: Lead by example. For me, I've never been a "soapboxy" or "preachy" vegan. I chose this lifestyle for myself and by proving that I can travel the world, have a full social calendar and maintain my health, I feel that my lifestyle is the perfect way to illustrate how fulfilling and beneficial a plant based diet can be. You get more bees with honey so being a positive example gets way more folks interested in what you're doing then by being forceful and negative. Carolyn: For the most part, I let stuff roll off my back. I've been very lucky as I really present my information in a fun way so I've not gotten much flack. But as with anything in life, if you are living your truth, don't let anyone else's problems become yours. I figure negativity towards others comes from an unhappy place, or fear of the unknown, and therefore it's unjustified for anyone to be putting their crap on you. Keep on truckin'! Carolyn: My mom ; ) She just celebrated her 1 year "veganiversary" and I'm so proud that she is really embracing the lifestyle for her health and well being ; ) She is spreading the word to many back home and I'm so excited to have her on my team! It's never too late to take an active role in your health! Carolyn: I cook a lot and host get togethers. And if I'm going to other parties, I bring a fabulous dish that knocks everyone's socks off. The way to a skeptics mind is through their taste buds! Plus I don't skimp on my workouts! Plus Carolyn's first cookbook, The Healthy Voyager's Global Kitchen, is due out in November 2011!! ..Lots of new spin off shows and other projects coming soon as well.